← The desk parts are piling up .. 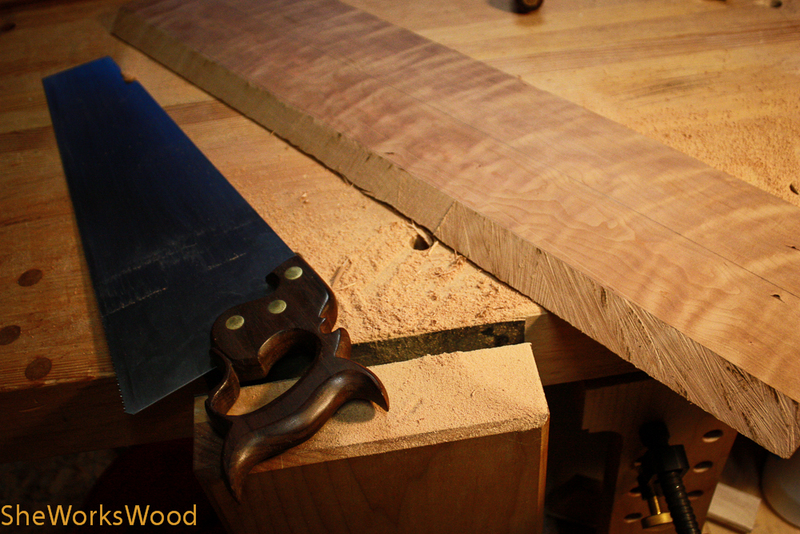 I started to cut the key board fold down front out of curly cherry tonight. Its my last piece of this beautiful board and I’m very sad about that. This entry was posted in curly cherry, desk, door. Bookmark the permalink. 5 Responses to My last piece of curly cherry ..
That’s a beautiful piece of wood. I’m anxious to see it finished. Marilyn, nice saw ya got there. What is it, if I may ask? Its one of Mr. Wenzloff’s panel saw kits (http://www.wenzloffandsons.com/component/virtuemart/saw-kits-and-parts/full-saw-kits/ps-kit-panel-saw-kits.html). Its an awesome saw and I had a great deal of fun putting it together. However, Mike has been having some very serious health problems. You’ll see a notice about it on his home page. I ordered a back saw from him in November and haven’t heard a peep after several emails to check on the status of it. If you’re interesting in ordering a saw from him you might want to call first and see how things are going. I suspect it’ll be a very long wait. It is. And you’ve been getting good at chip carving. I’m jealous.